The holidays are in full swing at our house. I know we still have Thanksgiving to enjoy, but I like to get as much Christmas prep work done before Thanksgiving. This way I can enjoy Thanksgiving through Christmas with my family without having to do a bunch of running around. My prep work involves buying gifts, planning meals and adding special activities to the calendar. No worries, I hold off on decorating until after Thanksgiving. However, Christmas music is playing at my home right now. We have several family and friends that have dogs and they consider them as members of their family. 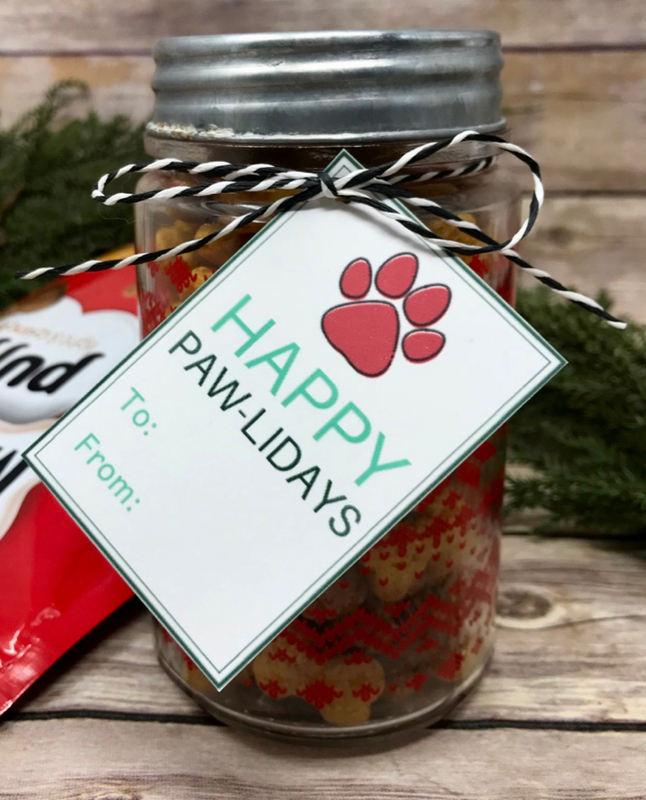 This year when I drop off a plate of cookies I thought it would also be fun to drop of a fun treat for their dogs too. 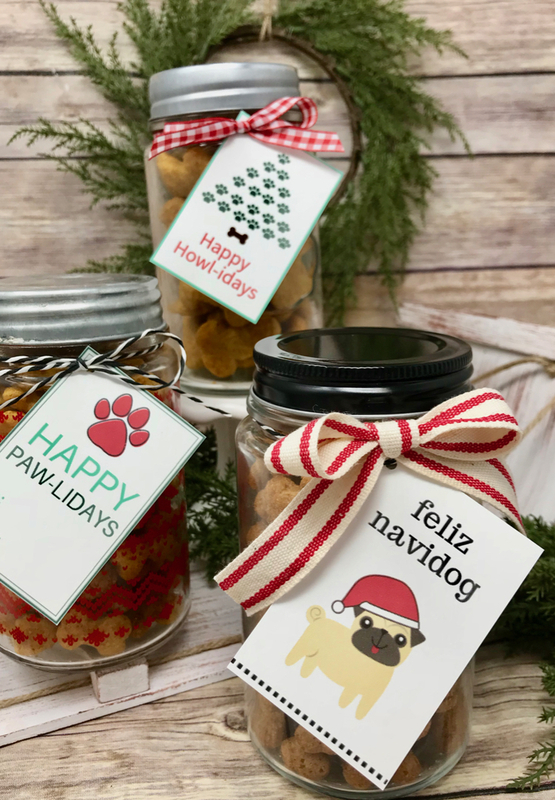 I made these simple dog treat jars and attached a festive holiday dog tag for gifting. You can make them too! 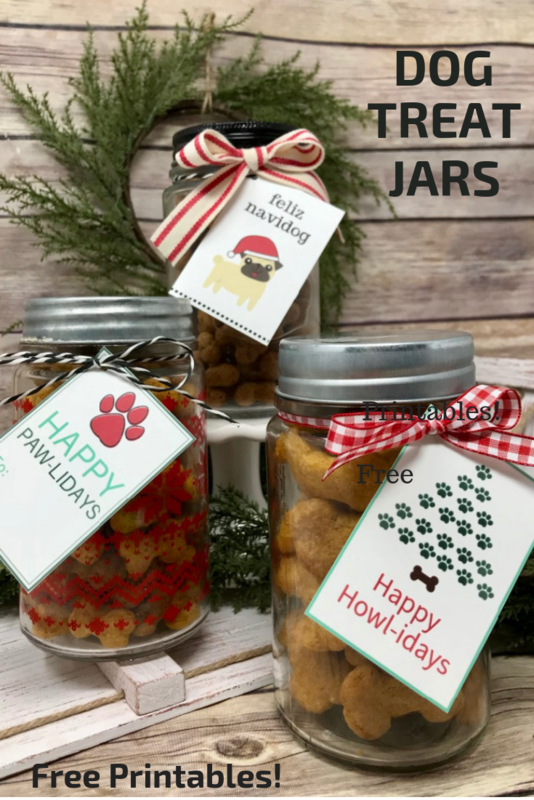 For these treat jars, I used jars I found in the Target Dollar Spot, you can just as easily use canning jars you already have at home. 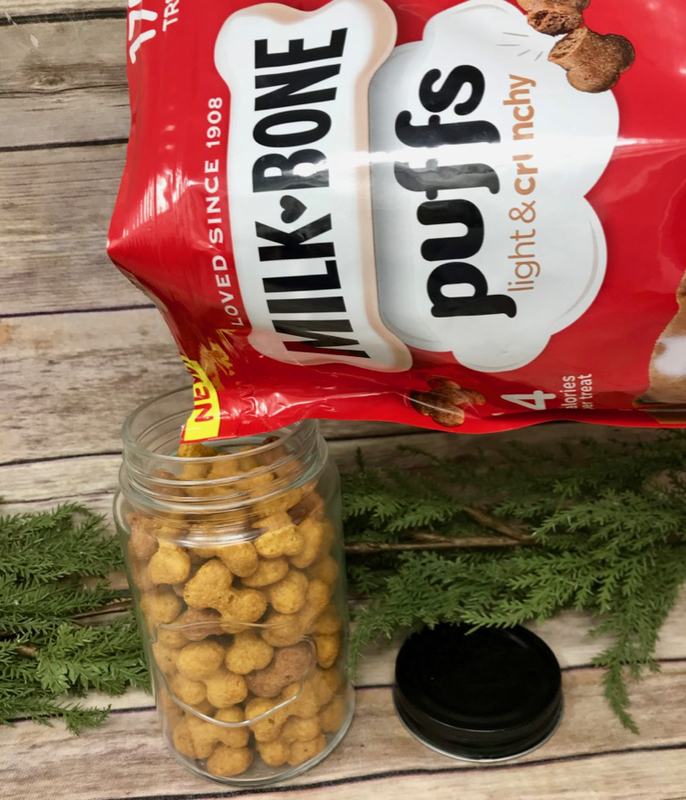 I filled the jars with Milk–Bone® Puffs™ light and crunchy dog treats. 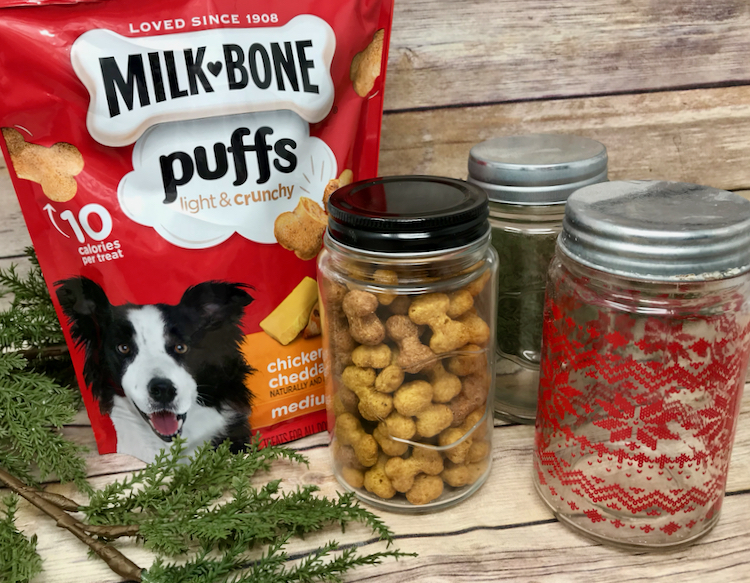 These treats have indulgent flavors and crave-worthy crunch your dog will loveThe treats come in two flavors, Chicken & Cheddar and Bacon & Peanut Butter and now is the perfect time to pick them up because you can save 30% with the Target Cartwheel offer. Milk–Bone Puffs are airy little puffs that deliver lots of flavor and crunch—without a lot of calories. 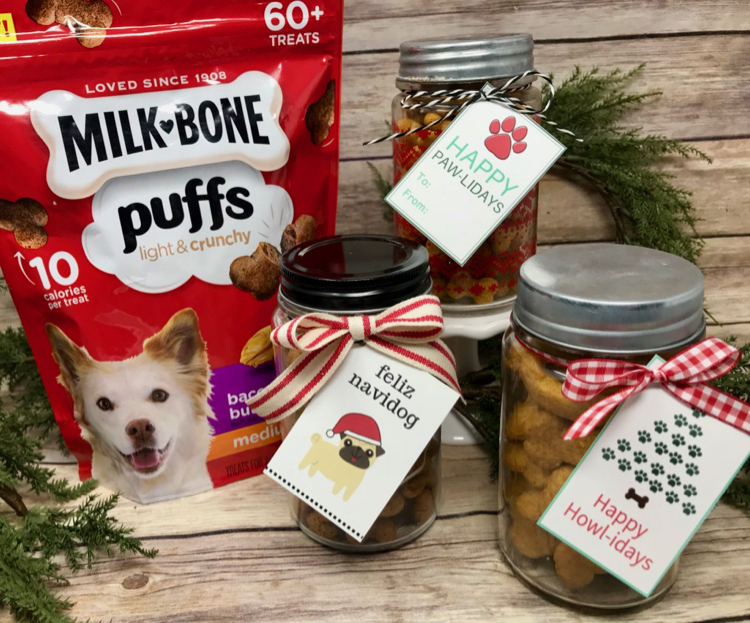 Show your furry buddy your love with a treat you can feel good about. 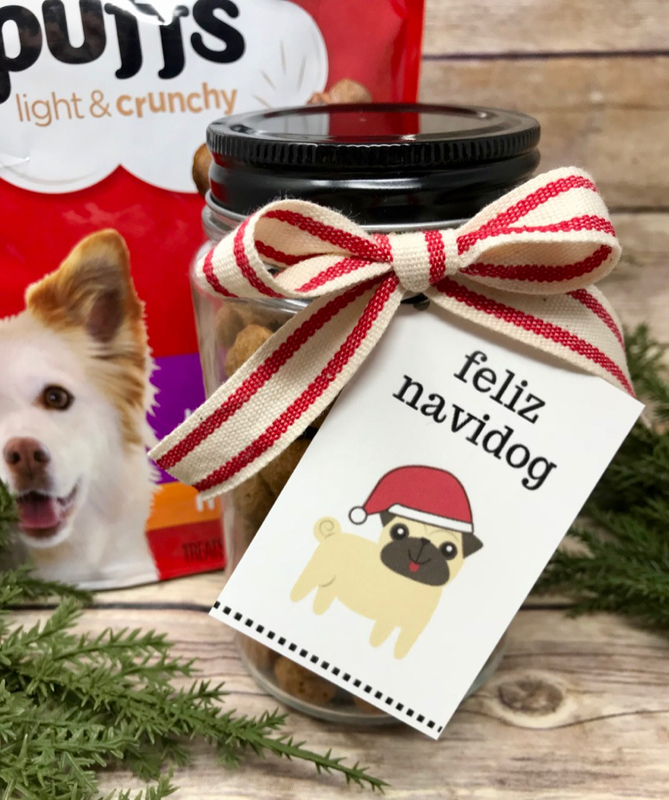 You can choose between mini or medium size depending on the size of dog you’ll be gifting these treats too. 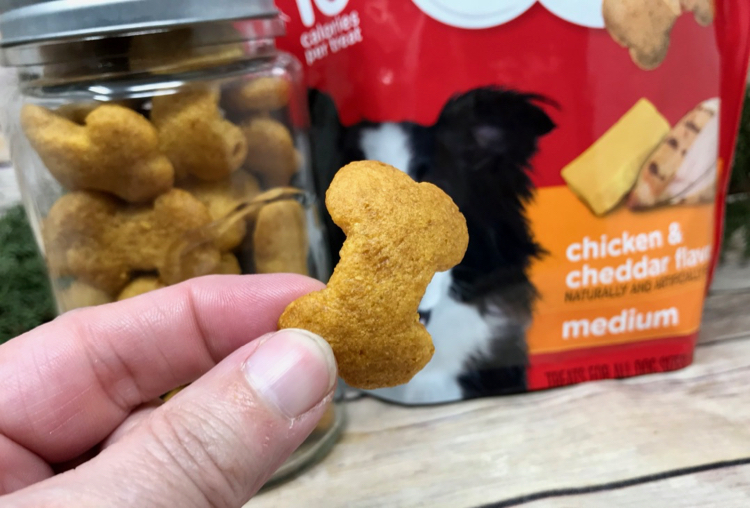 The mini size treats are only 4 calories per treat, and the medium size are just 10 calories per treat. Once the jars are filled you can add the tags. Use a hole punch to make a hole and thread the ribbon or string through to attach them to the jars. 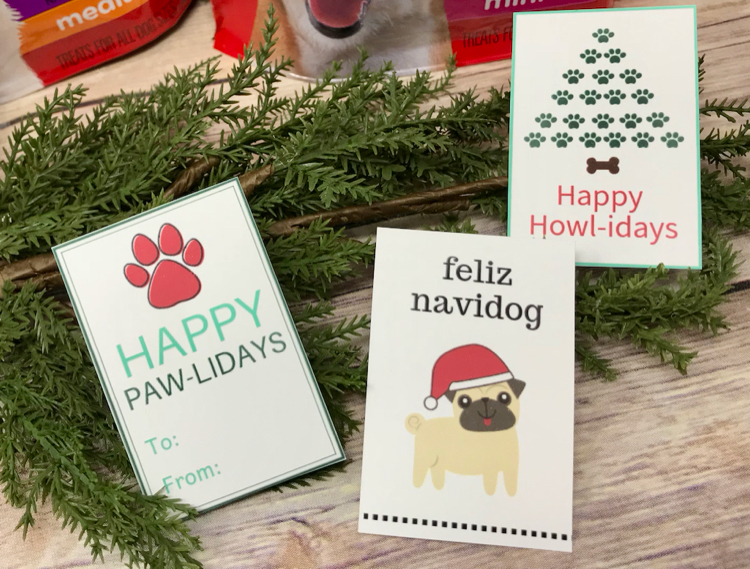 This is such a cute, quick and easy way to share holiday joy with your furry friends. 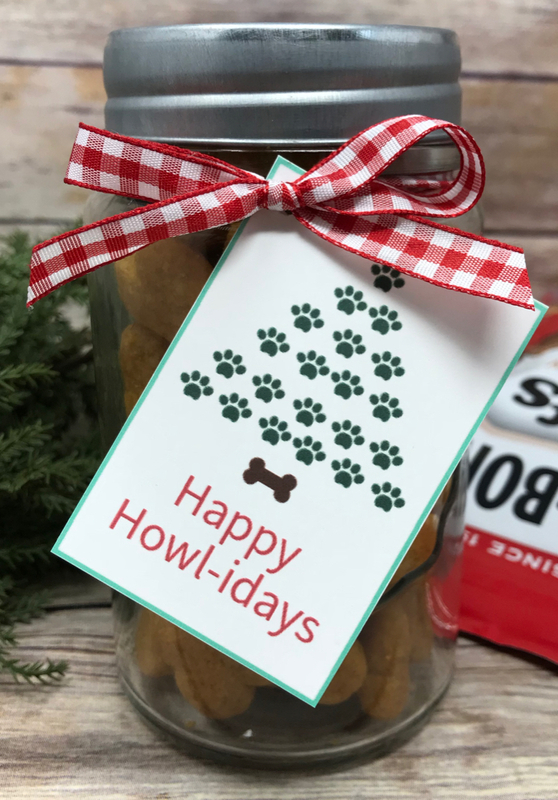 Not only will the dogs love their treats, but your friends and family will love your thoughtfulness too. 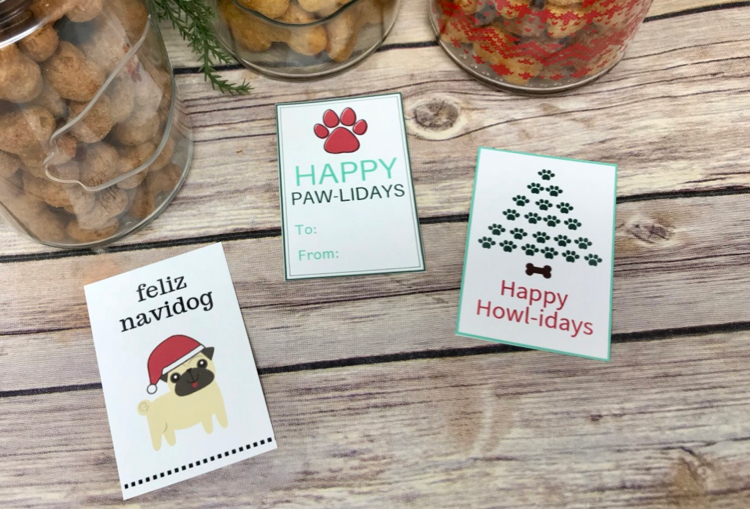 You can print your own holiday dog tags for free. Here is close-up of each style of tag. I think they turned out super cute and I love how quick and easy they were to put together. 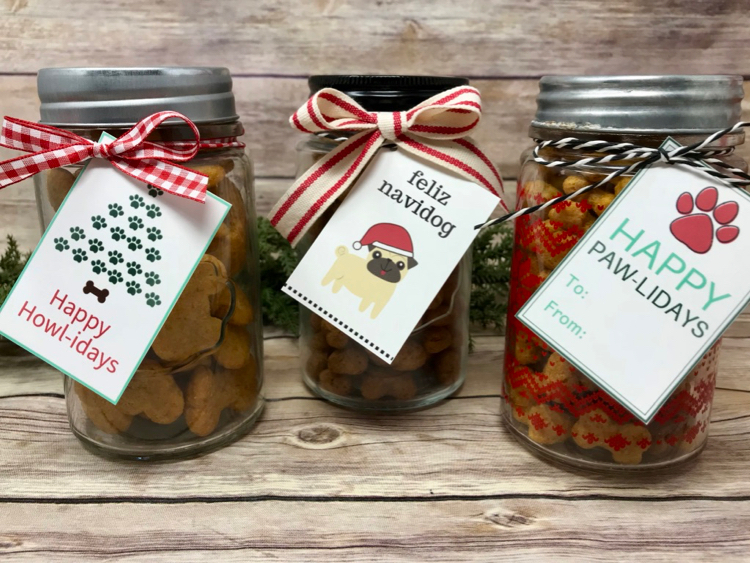 I also love the fact that it is something I could make ahead of time, so when it’s time to spread some Christmas cheer these dog treats are all ready to go. Another fun idea to celebrate Christmas with your pets is to create an advent calendar for them. My kids love to check their advent calendar each day, but they also like to treat they dog each day too. 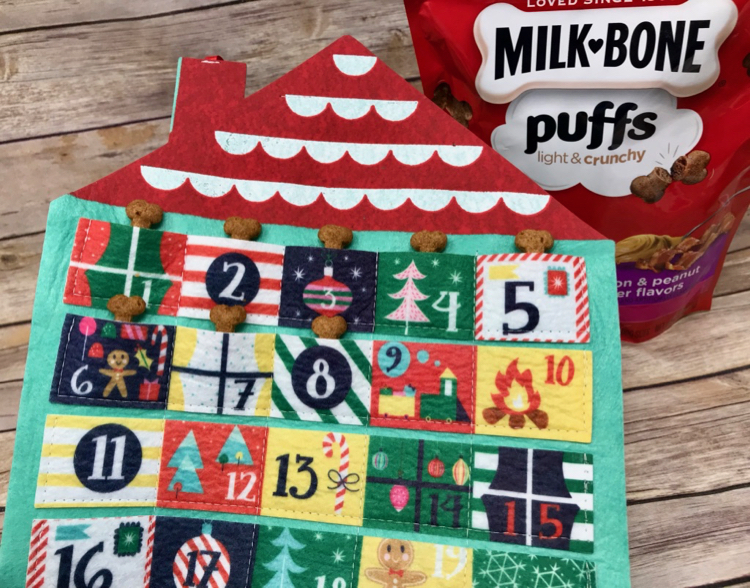 I found this Advent Calendar in the Target Dollar Spot for $3 and I filled it with the Milk-Bone Puffs mini treats. 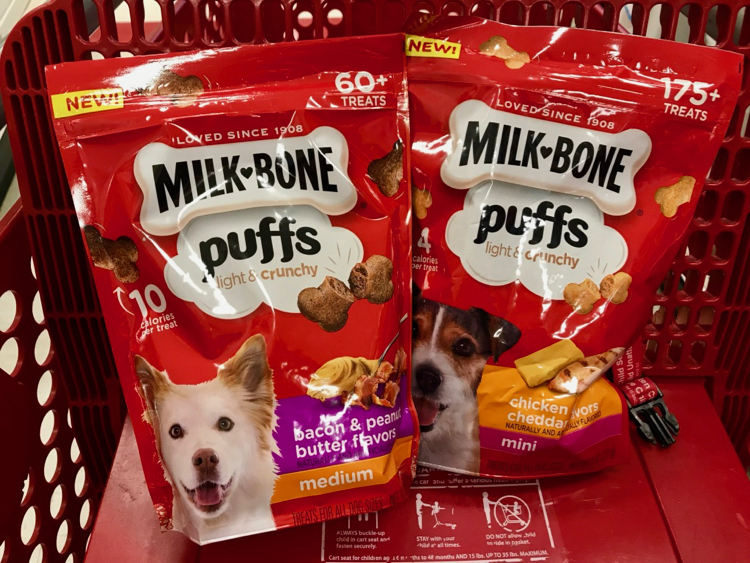 Make sure you load the 30% off Cartwheel offer for Milk-Bone Puffs, so you can pick some up and save next time you head to Target. The Cartwheel offer is valid through 11/24. 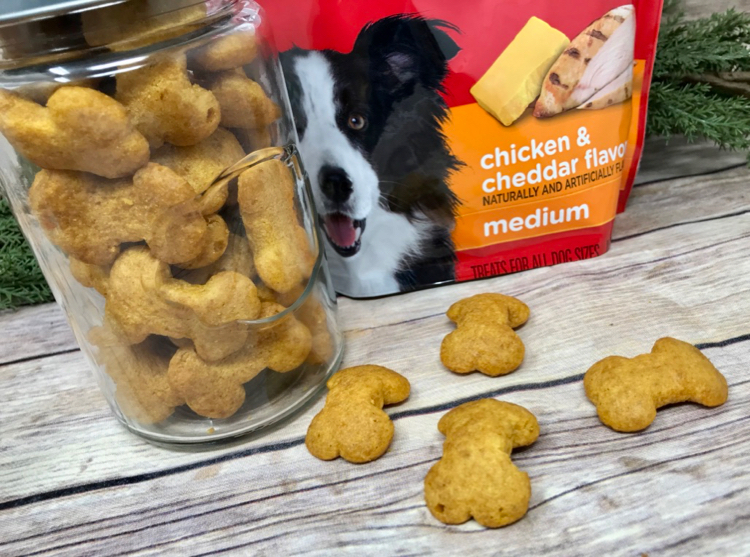 They really are the perfect treat to feed your pet because they are so light and low in calories. You can feel good about treating Puffs. My dog loves them!